A LAST SUPPER consisting of 11 courses, the pair who drank brandy and smoked cigars amid the chaos, and the couple who refused to leave without the other: there are a lot of stories behind the sinking of the ill-fated liner Titanic. Now, the exhibition that was named as Europe’s, and the world’s, leading tourist attraction last year has turned five years old. So far, Titanic Belfast has told these stories of the world’s largest passenger ship to over 3.5 million people. Behind each of the over 2,000 passengers and crew onboard the ‘unsinkable’ Titanic is a personal story and the fascination behind the story of the ship “continues to endure” for people according to Conal Harvey, vice-chairman of Titanic Belfast. To coincide with its fifth anniversary, Titanic Belfast has detailed some of the lesser known stories about the doomed ship. When 1st class passenger, and American businessman, Benjamin Guggenheim realised the ship was going down, he is said to have changed into his evening wear, alongside his valet. The two were last spotted on deck chairs drinking brandy and smoking cigars while chaos reigned around them. Isidor Straus and his wife, Ida, owned Macy’s Department Store in New York. When the dire situation with the ship became apparent, Ida apparently refused to board a lifeboat without Isidor, stating: “I will not be separated from my husband. As we have lived, so will we die, together. Isidor was offered a spot on a lifeboat to accompany Ida, but he refused as there were still women and children on board. The pair – both in their 60s – went down with the ship. The last meal served to first-class passengers on the ship consisted of 11 courses. The menu included consommé, cream of barley soup, a fish course, two meat courses, foie gras, three desserts, and a cheeseboard. There were 15,000 bottles of beer onboard the ship, along with 10,000 bottles of wine. It is estimated that a first-class ticket would cost at least €89,000 in today’s currency. 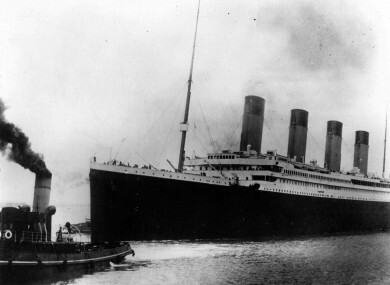 In total, 2,225 people boarded the Titanic, with 1,317 passengers and 908 crew members. The youngest passenger was Milvina Dean, who was two years old at the time. She went on to become a civil servant and cartographer in the UK. She was the last remaining survivor from the Titanic and died in 2009, aged 97. Email “As Titanic Belfast turns five, here are some of the stories behind the 'unsinkable' ship”. Feedback on “As Titanic Belfast turns five, here are some of the stories behind the 'unsinkable' ship”.